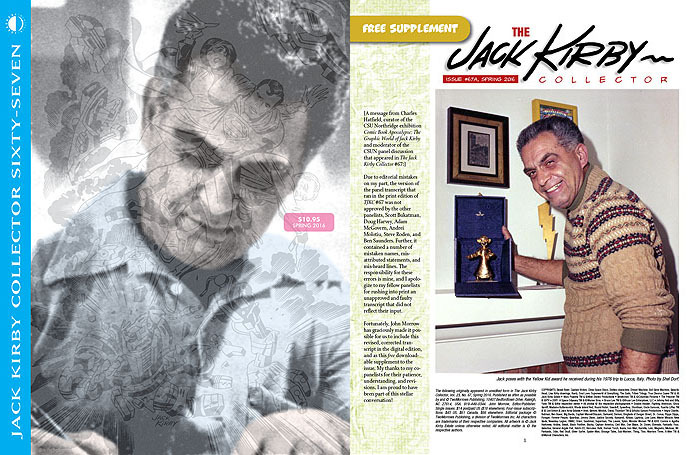 Shipping today is Jack Kirby Collector #67, taking an Up-Close & Personal look at the King of Comics. See a free preview and order HERE! Of note in Jack Kirby Collector #67: due to an editorial mishap, we accidentally ran an uncorrected version of last year’s fantastic CSUN (Cal State University Northridge) Jack Kirby panel in the print edition. We’ve corrected it for the Digital Edition, but we’re also making that FULL corrected version of the transcript available as a free Supplement for everyone at THIS LINK. This entry was posted in TNT on 31 March 2016 by Mr. Morrow. Wonderful WONDERCON is this weekend, and TwoMorrows will be there as usual. This year, it’s moved from Anaheim to Los Angeles, where we’ll be at booth #1612 (near DC Comics and IDW). So come on out and enjoy 40% OFF most items, and debut issues of Jack Kirby Collector, Alter Ego, and Back Issue! This entry was posted in TNT on 23 March 2016 by Mr. Morrow. 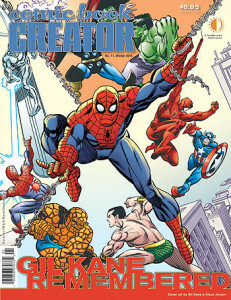 We’re off to press with another great issue of Comic Book Creator. 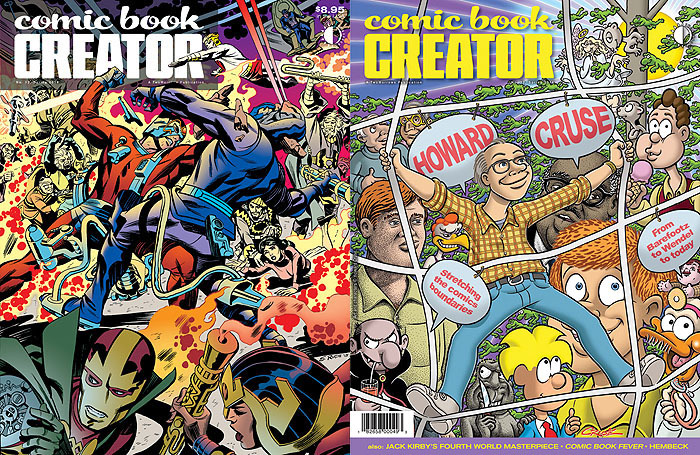 Issue #12 features Jack Kirby and Howard Cruse! Check out the free preview just posted HERE! This entry was posted in TNT on 21 March 2016 by Mr. Morrow. It’s March MODERN MASTERS Madness at TwoMorrows! 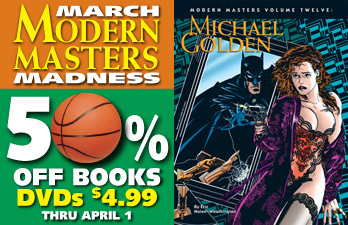 It’s March Modern Masters Madness at TwoMorrows (with 50% off books and $4.99 DVDs). With so many volumes on today’s top comic book artists, this deal is a slam dunk! They’re all under $8 each! This offer is good for online orders only, through April 1, and does not include standalone Digital Editions (but a free Digital Edition is included with your Print copy where available). SCORE! This entry was posted in TNT on 18 March 2016 by Mr. Morrow. 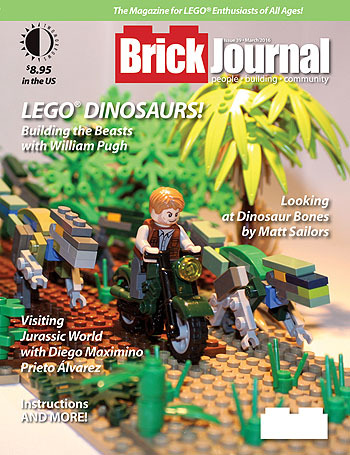 So don’t miss BrickJournal #39, spotlighting the jurassic use of LEGO bricks! It ships in late April, and we’ve just posted a free preview of the issue HERE! This entry was posted in TNT on 17 March 2016 by Mr. Morrow. Comic Book Fever is spreading like wildfire! Our long-in-the-works book on comics from 1976-86 is 100% finished, and goes to press as soon as we get orders from Diamond. 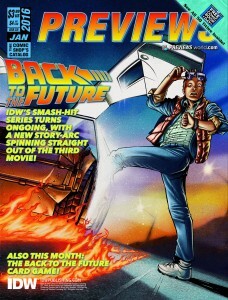 Look for the Spotlight on it in the new issue of PREVIEWS, Item # MAR161774, and reserve your copy now. This entry was posted in TNT on 10 March 2016 by Mr. Morrow. That’s it for this one! 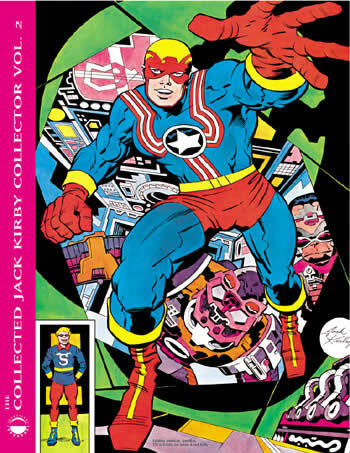 Collected Jack Kirby Collector, Vol. 2 is now officially sold out as well. That makes 5 titles that are done during our 75% OFF Clearance Sale, which runs through March 15. So don’t miss these great values, and likely your LAST CHANCE to get these from us. This entry was posted in TNT on 9 March 2016 by Mr. Morrow. 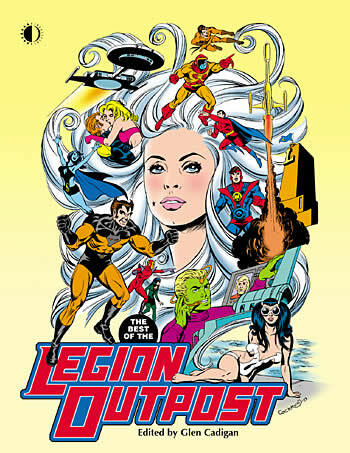 As expected, over the weekend, we sold out of The Best of the Legion Outpost! At 75% off, it was too much for readers to resist, so we hope you snagged one of our final copies before they were gone. There’s several more titles about to sell out during our Clearance Sale, so don’t delay! See all the 75% off titles HERE! This entry was posted in TNT on 7 March 2016 by Mr. Morrow. 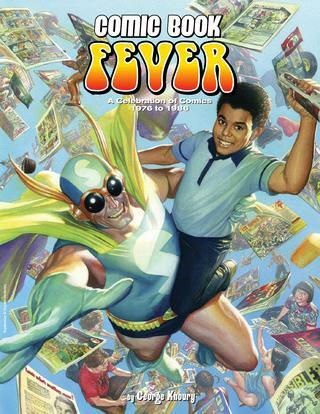 A free preview of COMIC BOOK FEVER is now live! This entry was posted in TNT on 4 March 2016 by Mr. Morrow. Bud Plant is one of the top comic art aficionados around, in addition to being one heck of a nice guy. His mail order company has lasted so many decades by only carrying the best of the best in comics and fantasy art publications. So we’re extremely pleased that he just gave COMIC BOOK CREATOR #11 his “Highest Recommendation.” Read Bud’s rave review of editor Jon B. Cooke’s opus on Gil Kane HERE.